A bridge between technology and family game night, Ozobot encourages kids to play and interact. 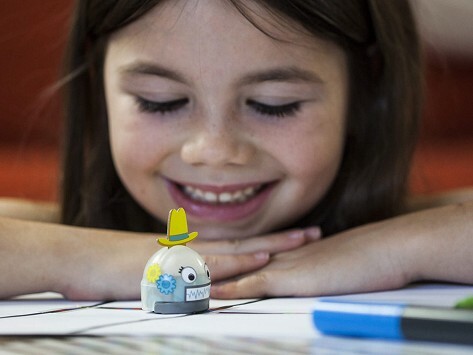 Kids code Ozobot’s movements by drawing color-coded lines on a tablet or on plain old white paper. Put Ozobot on the lines and he’ll do what the code says. Well-received gift to young teen granddaugther. Granddaughter reports that she loves her Ozobot! 8 yr. old grandson: BEST PRESENT EVER! Wasn’t sure if 8 year old would be too young, but WOW! I was THE most popular Gramma ever! He spent an hour and had to go out and came right back to learn more! Had to FaceTime me to show how it works! This was a gift for a 12 year old girl and she just loved it! Today, when kids play with technology it’s usually a solo endeavor. (Read = antisocial.) That’s the problem Maker Nader Hamda noticed watching his two daughters. They were both playing a popular mobile game, each confined to her own screen. Nader was inspired to create Ozobot, a toy that infuses technology with the social aspects of family game night. And he made it educational, too. This tiny robot reads colors and responds with different movements. Ozobot will follow the instructions you create. Make it advance, retreat, spin, speed up, dance, and more. It can learn hundreds of different commands. With the included app, kids draw colored lines on a tablet for Ozobot to obey. But Ozobot works on plain old paper, too. Use fat markers to tell it exactly what to do. As they’re teaching Ozobot to obey, kids are actually being taught. They’ll learn logic and basic coding skills as they decipher how to direct its moves. And best of all, this toy encourages kids to interact with other real-life members of the family.